Wallpaper - Love the wallpaper but it costs an arm and a leg!! Any suggestions for something similar but not as expensive ? Hi. This can be purchased through a design professional from Schumacher. Thank you for your question! Thibaut has a similar wallpaper in one of their newer books! This is the beautiful 'Feather Bloom' wallpaper by Schumacher. If you have any questions about this wallpaper, please do not hesitate to contact us at info@ethnicchic.com. What color paint is the wainscoting? - This looks to be a nice white that isn't too warm for the blues but not too cold to look stark white. Do you recall what paint color the wainscoting is? I am trying to find a good white with blue walls but they are coming out too yellow/antiquey or too cold. I want a nice clean look like this! Thanks! Hi. Thank you for your question. The paint color is Swiss Coffee from Benjamin Moore. where can I purchase the bench? - I love the bench ..where can it be purchased? Hello. Thank you for your question! That bench was purchased from Bunny Williams Home Store and then we had it custom covered in this velvet fabric. Good Luck! Lamp - Where can I find the lamp? Hi Peggy - I am so sorry I did not see this question until now. This lamp of from Worlds Away. Thank you! Installation of feather bloom? - Feather bloom looks spectacular here:) I managed to find a roll. Any tips on the install? It will be done professionally, but I suspect it's tricky and I don't have enough overage for mistakes! How easy it is to match the seams, vertically and horizontally (as the vertical repeat is about 66in I think, so there will be a lot of wastage if you can't use horizontal seams??) Many thanks for any advice! HI there. I do not have any suggestions on how to install it I usually lean on my installers to make the call on what the proper to hang wallpaper. As long as you use a good professional, you should be in good hands. Thank you. It was an item previously owned by the client so sorry I cannot help. Thank you! love the wallpaper! Who makes it and what is it called? Hello! Thank you for your questions. The wallpaper is from Schumacher and it is called "Feather Bloom". Entry Ceiling Light? - can you tell me where this is from? Thank you! Hello! Thank you for your question. This is from Circa Lighting. Love the side table. Where is it from? Thanks. Hi! Thank you for your question. The small bench/ottoman is from Bunny Williams Home. Mirror - Can you tell me where the mirror is from? Thank you for your question! The Mirror is from Oomph. Where can I purchase the mirror in this hallway? - It's the mirror in dark blue with a scalloped edge. 8. 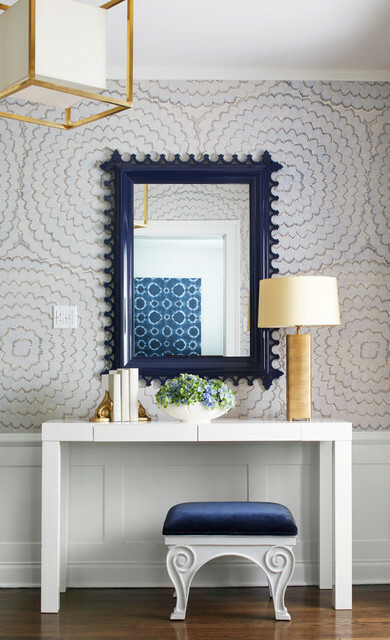 A blue and gold entry by Amy Kartheiser Design gives a Chicago family a vibrant space that fits their personality. What colors, patterns, themes or textures are you drawn to? Chances are you’ll find something you love if you spend time looking for inspiration. Doing research will allow you to see all the beautiful options available to you and get excited about adding it.Pro tip: Make sure to take your time and find a wallpaper that captures the right vision and vibe for your space. Your wallpaper may be with you for a while, so you might as well enjoy the searching process. Your ideal wallpaper is out there, so have fun finding it! Regardless of who’s doing the installing, make sure to read your wallpaper’s individual instructions and do what’s appropriate for your walls. Learning about your walls (and perhaps also the history of your home) is the easiest way to avoid problems. The mirror design and color. The bench with the lux fabric in a great color.